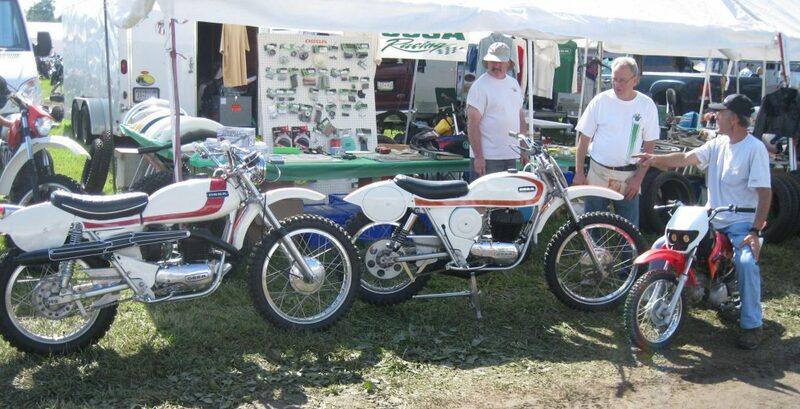 Beautiful early-1970s enduro bikes (like the SL-350 and SL-125 pictured) were all over VMD, as usual. The nice thing about bikes like this is that you can ride in the dirt and down to the Tastee-Freez!–just like the old days! 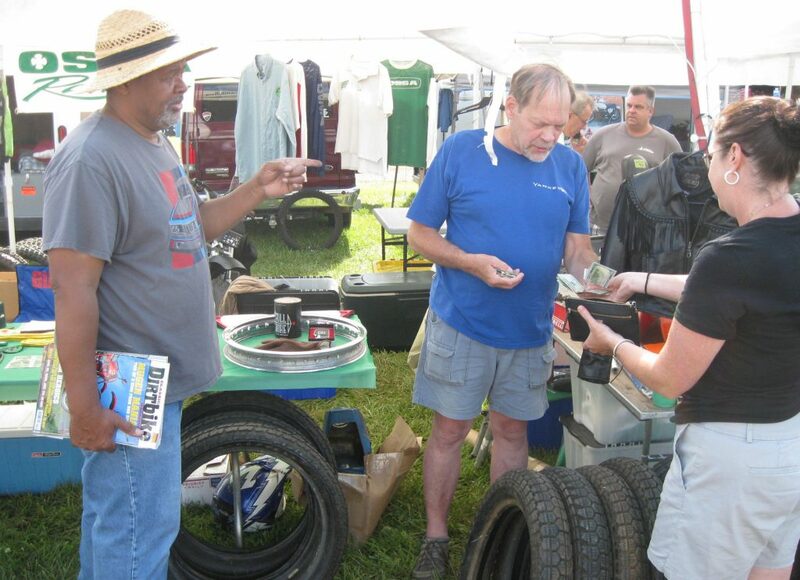 Former Pro MX racer and parts hoarder Brian “B.T.” Thompson warns the charming Heidi that “Yankee Bob” Fornwalt may be attempting to underpay for that used tire! Need a bike or a part? It’s here…somewhere. 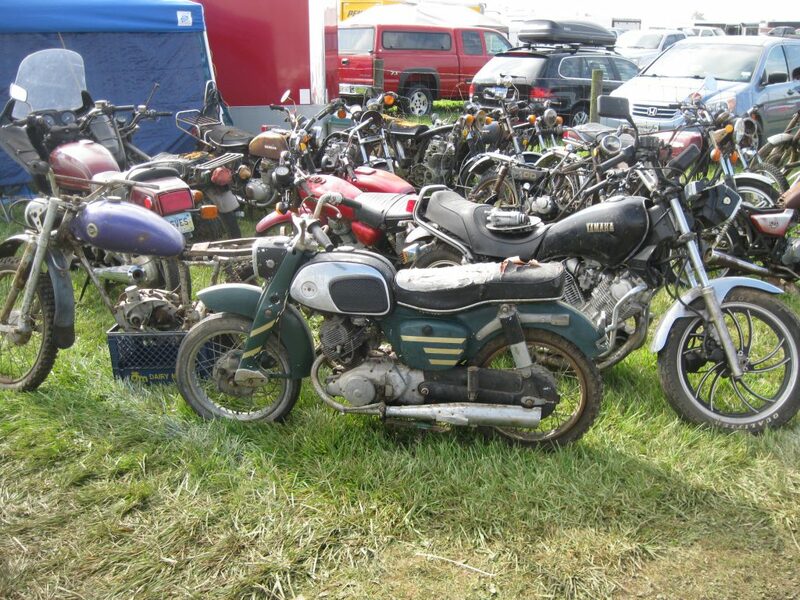 For the collectors, the swapmeet this year tended to be a little-of-everything collection: European and Japanese, dirt and street. We noticed minimal Euro-exotics this year—Maicos, CZs, Bultacos, Montesas and the like—but there were certainly a few. 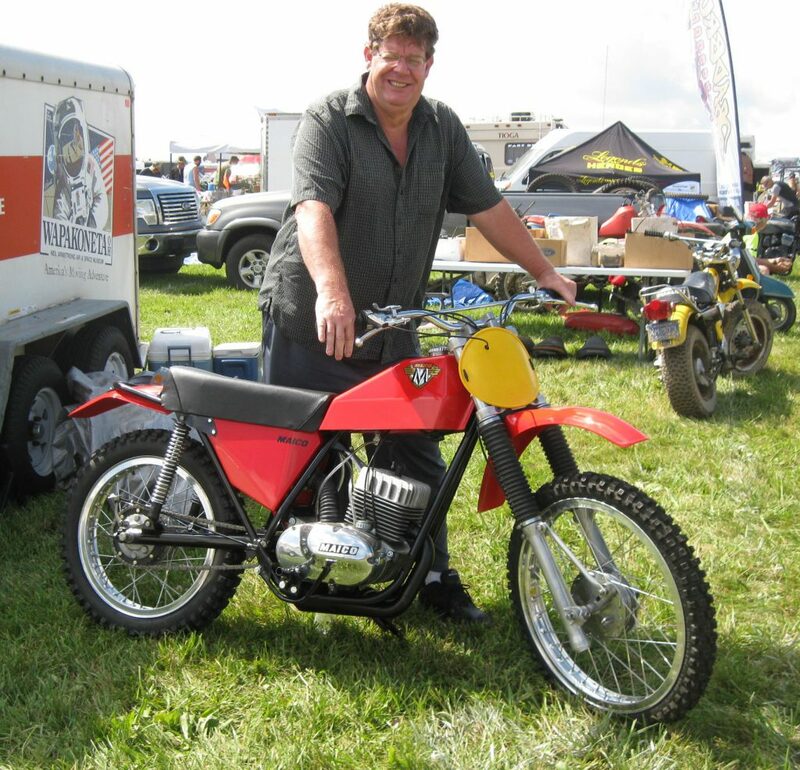 Dan Payne’s restored circa-1969 125 Maico (that he “found sitting in a field” after last VMD) was a joy to behold—and will be joining the Mungenast Museum, we’re told, along with the spectacular 501 he brought, last year. 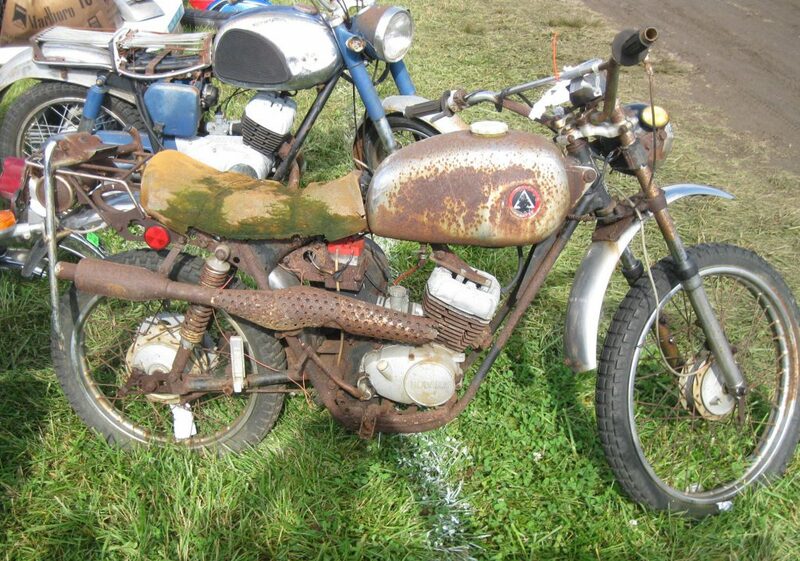 We noted many beautiful early-1970s Japanese endures for sale or being used as pit bikes. 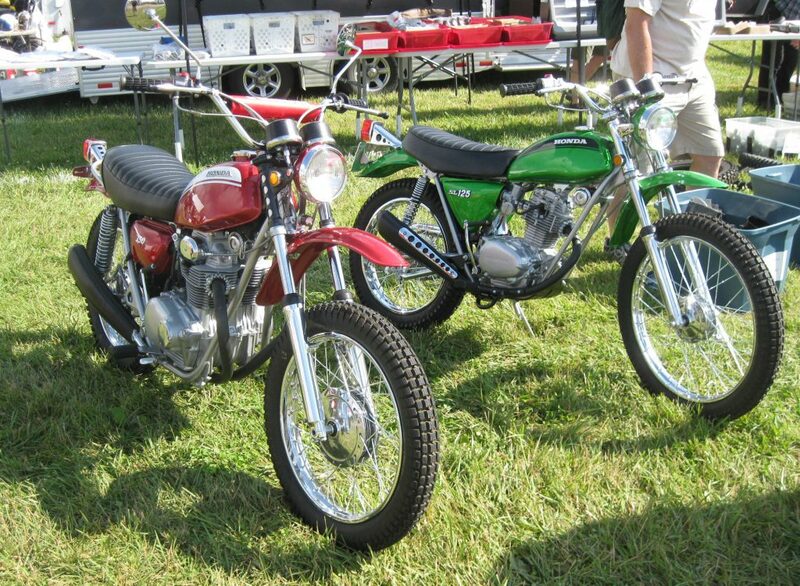 Being a Kawasaki devotee, I personally saw a handful of 350 Bighorns for sale at well below $1000. 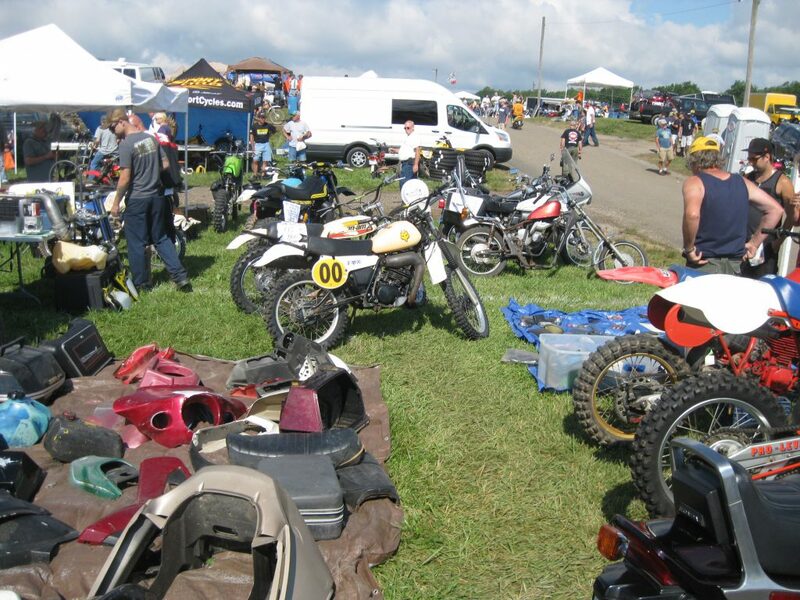 We enjoyed seeing a range of AJS Stormers in attendance, as well, ranging from updated pristine riders to projects. All in all, there was—like always—just about anything you could possibly want, for sale. Younger people were very much present. I still wonder how a 17-year-old excitedly carrying parts for an early-seventies Suzuki TM-400 came to develop such an interest (it must be a good story). It’s good to see, however it occurs. Especially pleasing were the numerous parent-child participants roaming the grounds. 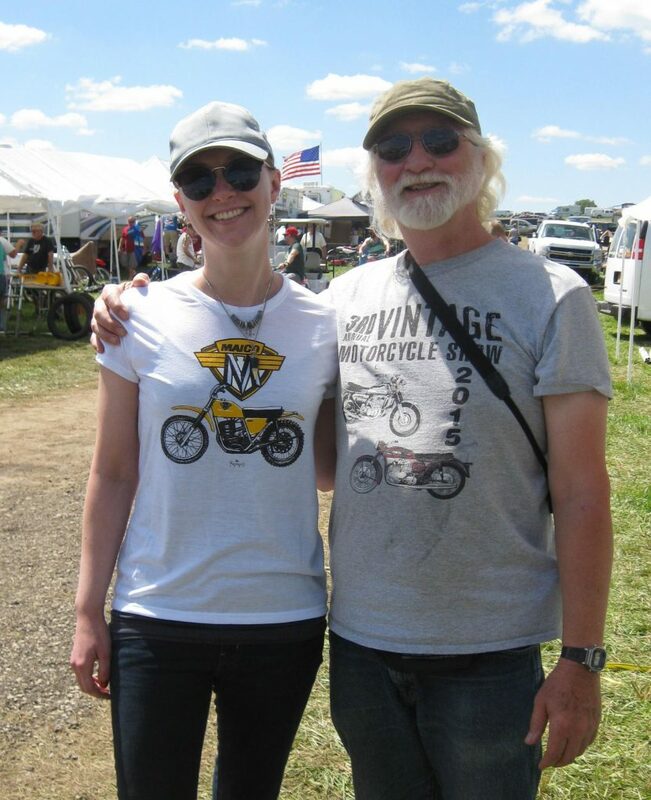 As opposed to the “graying” of membership, happening in some other vintage motoring organizations—most visibly, the Antique Motorcycle Club of America—the crowd at VMD seems to exhibit a reasonably healthy mix of young and old. 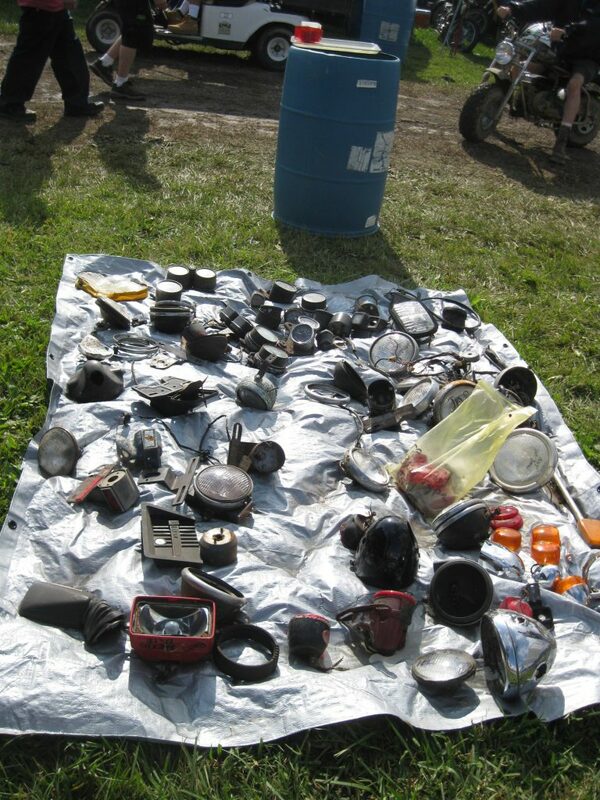 This mixture will be an important component for a healthy community in the vintage motorcycle hobby, in the years ahead. Yep; the wife will be so happy when you bring home one of these! Those attending on Friday, and especially those inhabiting tents, will not soon forget the storm frontal passage at mid-morning. While we knew some sort of weather nastiness was approaching (thank goodness for smartphones…sometimes), the extremely-strong pre-frontal wind arrived suddenly without any warning from the VMD/Mid-Ohio staff (at least nothing that we heard). Figures of 60mph winds were quoted, afterwards. Many tents were destroyed, and we heard of some vendors being injured by wind-blown tents. Our own tent survived—though needing extensive repairs—by means of the two of us holding onto the tent frame, as it threatened to lift up and depart for the next cornfield, for about 15 minutes of very interesting weather. We encourage the VMD/Mid-Ohio management to be sure to do their usual good job of identifying and announcing storm fronts, in the future. A “$5 for everything” tarp. There must be something you need, here. If you attended, we hope you enjoyed the event. Perhaps you brought home some old part that takes you back to experiences you had, or wished you’d had, long ago. Work on it…and bring it along and show us, next year! Daughter Sylvia and father John. Sylvia–besides wearing a highly-fashionable Vintage Motor Tees Maico ladies tee–came equipped with the utmost in jewelry: beneath B-25 earrings Sylvia sports a necklace made of old B-17 rivets, collected while volunteering in the restoration of the nation’s next flying B-17! This entry was posted in Vintage Motorcycle Days 2017 and tagged vintage motorcycle days. The ladies tee’s look great! I think my 125 is a 72??. thanks David.